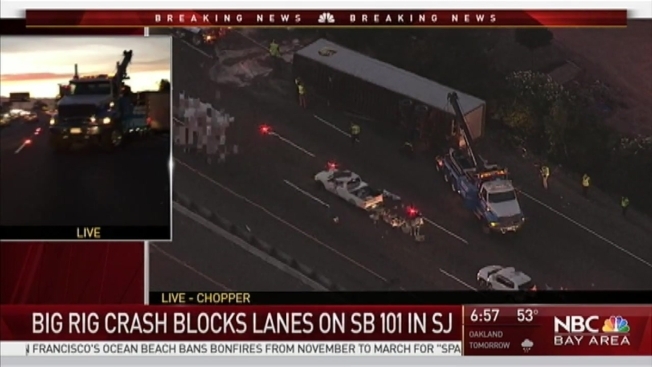 Southbound lanes of US Highway 101 were shut down near Brokaw Road in San Jose early Thursday morning for more than five hours after a after UPS truck flipped over on its side. The accident was reported about 4:20 a.m, and all lanes were reopened about 10 a.m.
A California Highway Patrol officer told NBC Bay Area that an SUV cut off the UPS truck, causing it to veer off the road and end up in a ditch. The two women in the SUV were taken to the hospital for minor injuries, the CHP said. A UPS spokeswoman said the driver wasn't injured. In a separate and unrelated accident, a UPS freight truck flipped over on Wednesday in Pleasanton off Interstate Highway 580. In that case, the driver was eating while he was driving, the CHP said, and lost consciousness before the rig went out of control. A UPS spokeswoman said the driver wasn't injured in that accident either. UPS spokeswoman Susan Rosenberg said in an email to NBC Bay Area that the two accidents were for two different units of UPS, heavy freight and small package. "We're grateful that there were no injuries and investigations are underway to collect incident details," she wrote.